We’ve all heard that word here and there: “emulsify.” Why do we need to emulsify a vinaigrette? It is simple, emulsify is just a sophisticated word used for saying that you are making ingredients that would not naturally mix together, like water (or vinegar or wine or citrus juice) and oil, come together. And we do want them to come together so that when we add the vinaigrette to a salad or a dish, we’ll be able to taste their combination and not their disparate routes. If you don’t make them mix, you may get one forkful of unappetizing oil-covered greens, and another that tastes overly acidic, making your eyes squint. To make them mix, or to emulsify, all you need to do is whisk with a fork or whisk or puree in a blender. By mixing fast, the oil breaks into the tiniest of droplets so that it has no choice but to mingle with the other ingredients. However, as it is natural, with the passing of time, the oil will separate again. In my kitchen, as in most Mexican kitchens, most of my vinaigrettes are oil based. I usually do a ratio of 1 vinegar (or citrus or fruit juice) to 2 or 3 of oil, depending on how acidic my vinegar or juices are and if I am adding other things. You know a vinaigrette is emulsified when it tastes homogenous, when you can’t feel the oil separated from the rest. 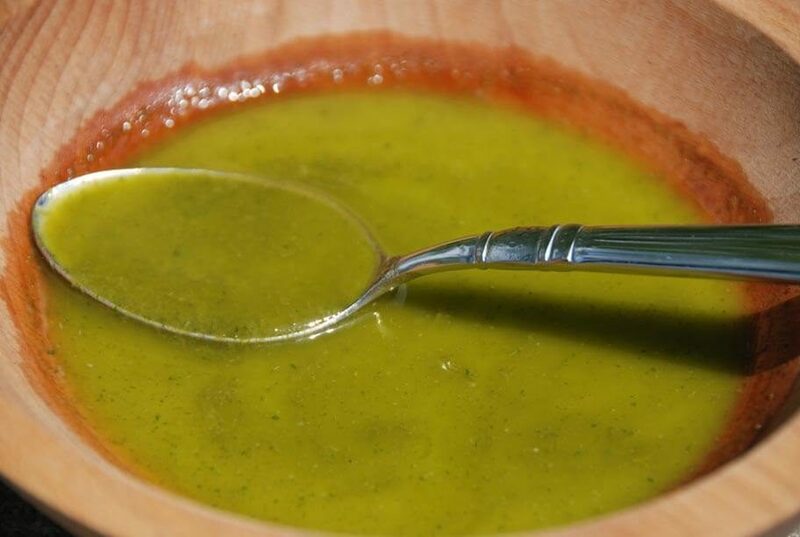 A common vinaigrette, like my cilantro one above, when ready, will look a bit cloudy, frothy, and slightly thickened. Salads are sometimes dressed with a few drops of vinegar and oil separately. But, the reward for taking the extra step to emulsify is the balance of flavors that come together and don’t reach for separate routes once in your mouth. Egg Yolk is also a natural emulsifier. I was hoping to see a discussion of the different things we sometimes put into a vinaigrette and how they aid in emulsification. Emulsifiers, let’s call them. In industrial applications you would add some kind of soap. In commercial food production you might use soy lecithin. In home use, we can use flavorful things that we wanted to add anyway. Some of the best edible emulsifiers include salt, sugar, and alcohol. The things I typically add to my vinaigrette that emulsify are sea salt, honey, and ground mustard seed. Occasionally I’ve added these things and given it a good rip with the immersion blender and I’ve actually gotten it to emulsify too much, giving a mayonnaise-like consistency. With practice I’ve found the right balance of whisking and ingredients to make a consistent vinaigrette that comes together again with a good shake but doesn’t get too thick.